As Donna and Jim spend more time in the orchard, Irwin’s daily activities have settled into a routine of accompanying them to the orchard, with lots of breaks when it’s hot. Irwin has been working on sticking close to Donna in a heel or side position (“heel” is on the left, “side” on the right). He has also been doing well with “leave it.” Since they’re thinning peaches right now, there are peaches on the ground that he has to ignore, as well as weeds, twigs, and turkey manure. (The orchard is organic.) Donna keeps Irwin’s leash attached to her waist. When she was training SSD Judge, he managed to get into the manure, so rather than give Irwin the opportunity to get into mischief, she helps set him up for success by keeping him leashed. Before they move on to the next tree, Irwin practices heeling, and he’s quickly getting the hang of it. When there isn’t much rain, they also water the trees. There’s a water tank and hose on the ATV, and Irwin either rides with Donna in the utility, or walks with Jim as he waters the trees. Irwin’s balance while riding in the ATV is great, and he is developing muscle strength. In the heat of the day, they take lots of breaks. Irwin gets plenty of play time, when he plays ball early or late in the day and goes swimming. During breaks, they also practice “visit,” “up,” “all the way up,” “car” (cue to get in the car), “fix-it” (cue to untangle his paws from the leash), “stay,” “come,” “paw,” “under,” and “back.” They also practice greetings with the other workers. All of our service dogs learn how to get dressed in their service dog harness. It’s a useful skill, especially if their partner is unable to put the harness on themselves. On the cue “get dressed,” the dog walks into their harness so their handler just has to buckle it. Irwin has started walking into his harness, and when it’s time to take it off, he walks backwards out of it. In the house, Irwin practices being in a restaurant. Donna walks with him around the table as if they were at a buffet, and then Irwin lies under her chair or the table while she’s eating. They’ve also been working on his self control at doorways. Donna has been having him wait at all thresholds before going into rooms, and he sits at the outside door waiting for the “go on through” cue. This practice has helped him stay focused despite the many distractions that are outside, such as rabbits and chipmunks. He doesn’t bolt through the door to chase them, even though he has had many opportunities to do so. Instead, he chooses to look intently at them and ultimately ignore them. Donna has also been working to keep Irwin tucked in closer to her when he’s in a sit or down. It has helped keep him from sprawling out when they’re in public. And when she’s working in the kitchen, Irwin relaxes on his blanket in the kitchen, keeping him out of the way. Check back on Monday to read more about Irwin’s experiences in puppy class and at a restaurant. The numbers are in for the Highmark Walk for a Healthy Community. You helped raise $17,986 for Susquehanna Service Dogs! Wow! Thank you so much to everyone who raised money, donated, and joined us for the Walk! You did an amazing job! We have some of the best volunteers and supporters. 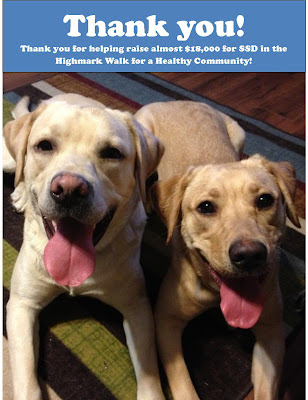 Did you know that 182 people signed up to walk for us in the Highmark Walk? That's more than any other group that did the Walk! Thank you for continuing to support SSD. Friday was the first day of summer. Summer means warm weather, picnics, swimming, fireworks, and simply more time spent outdoors. If you have a dog, you may want your dog to join you for some summer fun. Here are five safety tips so your dog can safely join in. Don’t leave your dog in the car. Even if the windows are open and you park in the shade, your car will heat up to dangerous temperatures in minutes. If you can’t take your dog with you, leave them at home. Know the signs of heat stroke. Dogs don’t sweat (except a little bit through their paw pads) and they rely on panting to stay cool. If you’re playing outside, be careful not to over exercise your dog, even if they look like they’re having a great time chasing tennis balls around the yard. Your dog may overheat and start to show signs of heat stroke. Here is a list of signs, from mild to severe. If your dog has any of these symptoms, start cooling your dog down immediately. Move the dog into the air conditioning, spray him down with cool water (not ice water), place cool packs around your dog’s groin area, and wipe his paws with cool water. Monitor your dog’s rectal temperature and stop cooling your dog once his temperature drops below 103 degrees Fahrenheit. Take your dog to the vet as soon as possible. If you have an SSD dog in training, be sure to contact the puppy coordinator. Avoid walking on hot pavement. Unlike people, most dogs generally don’t wear shoes. Spending too much time on hot pavement can burn their paw pads. Try to walk your dog on the grass or in the shade, if possible. If you have a working dog, try to minimize the time your dog needs to walk on pavement. Make sure your dog has plenty of cool, fresh water. Your dog should have cool water to drink. If you happen to have a baby pool, you can fill it with cool water for your dog to wade in. However, be careful about giving your dog ice. The sudden coldness can cause severe muscle spasms that can lead to bloat, which can be deadly. Groom your dog. Good grooming will keep your dog’s hair from getting matted, which can trap heat. By regularly grooming your dog, you can also spot fleas and ticks. Since the bugs come out with the warm weather, it’s always a good idea to make sure your dog is up to date with his flea and tick and heartworm medications. I have just been dying to take Lagoon to Hershey Park. We only live a few miles away, and I knew it would be great practice for her – lots of sounds, lights, moving objects, smells, food on the ground, people …. Lots and lots of people. Anyone who knows Lagoon understands that like Will Rogers, who said “I never met a man I didn’t like,” Lagoon has never met a person she didn’t like. I anticipated that people would be our most difficult challenge. Finally the day was here! I had the day off from work and the weather was beautiful. I loaded up the treat pouch with kibble, but also threw in a bunch of new pepperoni flavored treats that are fairly new surprises to Lagoon. Of course I grabbed a can of cheddar cheesy spray for back-up! Although we were leaving for the park right after Lagoon’s midmorning “Get Busy” break, I also threw a roll of small bags into my purse just in case. Lagoon “Got Dressed” in her harness and I chose the shortest leash that I could find – it’s about 3 feet long, but once I grab it and hold it the way I need it I think it is closer to 2 feet – so that I could (hopefully) maneuver Lagoon through the crowds without her deciding that other people were more exciting than me. I planned to keep Lagoon at the park for a 2 hour maximum, depending on her behavior. I also knew that I might need to make an “early exit” – so in addition to me and my kids, my dad went along so that Lagoon and I could leave if necessary without interrupting the kids’ fun. When we got to the park it wasn’t as busy as I thought it would be – probably since it was a weekday – but there were still plenty of people. Lagoon did great walking in from the car, standing in the security line to get my bag checked, and going through the ticketing line. We decided to take Lagoon to the monorail and ride. Lagoon didn’t hesitate, and stayed in a “down-stay” the whole ride. When the ride was over Lagoon even waited for me to cue her to exit the ride while other people walked past! I was surprised! My dad and the kids went on another ride while Lagoon and I waited. On the ground by the bench I chose was a bunch of peanut shells. Lagoon REALLY wanted to eat those peanut shells. We practiced “leave it” but ultimately I decided to move a little farther away from the temptation! After we moved, Lagoon had a nice greeting with two of the park workers. Then the ride was over and we were on the move again! About every 2 or 3 steps was a click & treat, and even though it was a short leash Lagoon kept it nice and loose walking next to me. I didn’t even need to break out the cheese! As we walked we saw a traveling band playing. I wasn’t sure how that would be, because when we were at a Memorial Day Parade, Lagoon seemed startled by the drums in the marching band – but she wasn’t fazed at all today. By this time it had been almost an hour, so we decided to take Lagoon to the carousel for her last bit of fun at Hershey Park. She waited patiently in line even though we were surrounded by children about her size. At first when we got on the ride I sat on one of the benches and had Lagoon lay on the floor in front of me, but the ride attendant asked if I could actually get her into the immovable car – so that’s what we did. Lagoon lay at my feet during the ride and was quite well-behaved. Lagoon and I left my dad and my kids and headed for home. On the way out, we had to navigate the turnstile! I really had to think about that for a minute. I decided to give Lagoon the “go on through” command, and then had her back up until she was out underneath the turnstile and I could follow her through. She did it perfectly! Since Lagoon had done so well in the park – and because I was running out of treats – I decided to reward her by getting out the cheese for the walk back to the car. Needless to say, Lagoon was very excited (and of course on her VERY best behavior) all the way to the car. I took Lagoon home, got her settled and returned to Hershey Park to spend the afternoon with my dad and the kids. In total, Lagoon’s visit to Hershey Park lasted an hour and a half – and was a good experience for both of us! With all the rain last week, Donna and Jim tried to take care of many of their errands (and take Irwin with them, of course), since they couldn’t work in the orchard. First, Jim took him with him to pick out new eye glasses, and then they headed to the Agriculture building, where Jim was giving a presentation on organic fruit. Irwin did great in the Agriculture building. All that hard work practicing “leave it” in the garden paid off! Irwin kept his focus on Jim. In fact, the gentleman who arranged the presentation was so impressed that he wanted to see if Irwin would give him the same attention if he was holding the leash. Irwin did! They also went to Bass Pro to practice using the elevator. There’s an elevator at the back of the store that most people don’t use, which can make it perfect for practicing without too many distractions. As they waited for the elevator to reach their floor that day, however, Donna heard voices. Realizing that people were in the elevator, she cued Irwin to walk backwards and then sit. Turns out, it was our trainer, Amanda, and SSD Howdy and his partner. They were practicing for the public access test. Irwin did great—no pulling toward Howdy. And Howdy did great, staying focused on his partner. They visited Kars, the mechanic, to have some work done on the car. The manager at Kars has said that Irwin is welcome anytime while their cars are being serviced. Irwin stayed nicely in the waiting room with Jim, while Jim took care of some book work. It was quite the busy day for Irwin, because he also went with Jim and Donna to the dentist. Irwin and Jim waited while Donna had her teeth cleaned. Irwin drew the attention of the staff and other people. They had lots of questions, and of course, wanted to greet him. Irwin had some time to go swimming, and then it was off for Donna’s eye exam. Although Jim accompanied them, Donna wanted to see what it would be like to have Irwin with her during her eye exam. He did very well, although his sleepiness may have contributed to his good behavior. He made good choices while in a down-stay. For example, he didn’t move when the optometrist came in and greeted him, nor did he move when other people greeted him. Since there wasn't a lot of space in the room, Donna laid a hand towel in one corner and cued Irwin to "go to bed." He curled up on the hand towel and slept the entire time! Irwin finished out his busy day at Nail Clipping Anonymous (NCA) class and puppy class. NCA is a required class for all of our puppies. Puppies and puppy raisers work on nail clipping until the puppy raiser can successfully clip a nail in front of a trainer while the dog stays relaxed. Irwin may have had a full day, but he still managed to pass NCA! Irwin then slept the whole ride home and went right into his kennel for some serious sleeping time. After looking at all the photos she and Jim had taken of Irwin, Donna realized that she has another thing to add to Irwin's list of things to practice. She noticed that when Irwin is in a down-stay, he tends to sprawl out, rather than tucking himself next to Donna. They'll be working on that next! SSD Irwin has been working on his “sit.” His down-stay had become so automatic that he stopped sitting on cue every time. To fix this, Donna started cuing him to sit every chance she got. He caught on quickly, and loves to turn it into a game whenever they’re training! Donna would put Irwin into a down-stay on the deck and then hide. Then she’d call Irwin to “come,” and he comes bounding over with enthusiasm to find her. If he sits on cue, he gets a jackpot of treats. Look at how tall he sits, like he’s trying to stretch up as high as possible. In addition to working on the hand signal and verbal cue for sit, Donna has added some additional challenges for Irwin. When giving the verbal cue, sometimes she’ll say it in a normal voice, sometimes in a whisper, and sometimes she’ll just mouth the word “sit.” This is great practice because you never know how you’re going to be able to deliver a cue in a real world situation. Irwin loves chewing on sticks, and since his puppy raisers have an orchard, he’s in stick-chewing heaven! However, he isn’t always allowed to play with sticks, so Donna has been using them for “leave it” practice. After they pruned some of the trees, she brought some branches back to the house, and she and Irwin walked around and through the sticks and branches, using the “leave it” cue. He’s gotten really good at it! He can now walk through the orchard without dragging branches and sticks to chew and play with. He can also walk through Donna’s flower beds without biting at the plants and flowers or picking up sticks, pine cones, or pebbles. Irwin has been supervising Donna when she works in her flower beds and vegetable garden. He goes with her and Donna asks him to sit-stay for a good five minutes before she cues a down-stay. She started having him sit for an extended time so that “down” doesn’t become his default position, regardless of the cue he actually received. Sometimes Irwin gets to play with a toy or a bone and other times he just hangs out in an extended down-stay. Donna keeps him fairly close to her in case she needs to cue him to “leave it.” As a power treat reward, Irwin has been getting sweet potato skins and banana chips, which he loves to crunch. In May, Irwin started swimming! Donna and Jim have a pond, and Irwin used to be very hesitant about swimming, even though he saw Judge paddling around. Then one day at the end of May, he went it, and before he knew it, he was doing a high stepping doggie paddle! He stretches his head up as high as he can and his legs look like he’s marching. Now that he enjoys swimming, it has become his reward at the end of the day when they get back from the orchard. With practice, he learned how to doggie paddle more efficiently, and he no longer high steps in the water. However, now that the pond is a big reward for him, Donna has also been using it for “leave it” practice. They’ve been working on Irwin’s behaviors while he’s off leash. She and Irwin have been walking the perimeter of the pond with Irwin off leash. He’ll stay right next to her and ignore the pond, as long as she clicks and treats. He also knows where there’s a dead toad in the driveway that had gotten run over, and he can walk by it without going toward it to sniff or pick it up. He also discovered a dead dove by the fence one day while they were playing ball. When he spotted it, he jumped back and then sniffed at it. When Donna said “leave it,” he chose to pick up the ball and return rather than go after the bird. When he’s off leash, he has also learned that he doesn’t always get to go in the ATV. Irwin watches Jim leave in the morning, and then looks at Donna, who cues him to stay. Irwin looks back at Jim driving up the road to the orchard, but he chooses to stay rather than run after the ATV. Although Irwin is growing up and learning lots of new skills and behaviors, he can still get into mischief. He chewed the stuffing out of a second pillow bed! After cleaning up the mess, Donna put him in his crate. After a little while, she let him out, but told him to stay in the mudroom rather than joining her and Jim while they had coffee. Irwin stayed in the mudroom, even though his usual routine is to join them. By their second cup of coffee, however, they invited him to join them, and Irwin got his usual belly rub. Should I Use a Head Collar on my Dog?